POSTED: Tue, 06/20/2017 - 16:00 | POSTED BY: Traci C.
2018 Disney Dining Plan includes alcoholic beverages and specialty beverages! Yes, you read that right. Beginning in 2018 guests on the Disney Dining Plan can order a specialty beverage (including milkshakes, premium hot chocolate, or smoothies) and guests who are 21 and older can order a alcoholic beverage (or specialty non-alcoholic beverage). The addition of the specialty beverage (non-alcoholic AND alcoholic) applies to both table service and quick service meals. The "specialty" alcoholic beverages include: beer, wine, cider, sangria, mixed drinks, and specialty cocktails. For a full breakdown of the price differences between 2017 and 2018 and what each Disney Dining Plan includes check out this post from our friends at the Disney Food Blog. In all, the cost analysis shows about a $10 increase from this year's Dining Plan to the 2018 Dining Plan. If you're looking for even more information about the Disney Dining Plan in general you'll want to bookmark the Disney Dining Plan page from the Disney Food Blog. 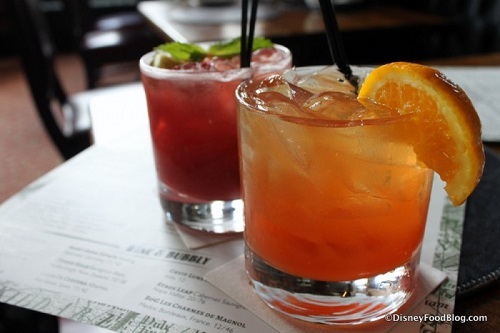 What are your thoughts on the addition of specialty drinks and alcoholic beverages to the Disney Dining Plan for 2018? We'd love to hear your comments on this major change! This is a fantastic addition. Bravo! Yay! I'm excited for this, it is totally going to save my family money.